In my basement, near my writing desk, I have an idea board. On this board, I like to jot down some big picture ideas for each of my stories. Typically, these ideas get erased when it’s time to start my next story. Of course, I keep a notebook with all of my ideas as well, the board is simply for those broad strokes. Anyway, I’ve finished my latest Dr. Nekros story entitled “The Inevitable Demise of Anton Hall,” and, because I’m growing more sentimental with every passing day, wanted to capture these notes for posterity before erasing them. 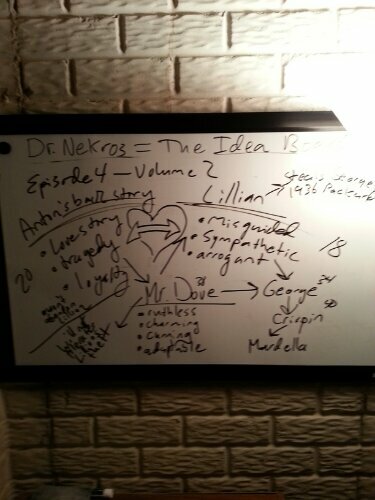 If you’ve been following my Dr. Nekros series, it may be fun for you to derive some clues about “The Inevitable Demise of Anton Hall” and the entire series as a whole from what you read on the board. This entry was posted in Author News, Sketches and Notes and tagged creative writing, Dr. Nekros, fiction writing, kindle stories, serialized stories.